"I'd rate you all 5's but I'm anxiously waiting to see if the sump pump I installed will keep my basement dry during the next..."
Jeff has a great understanding of the importance of a dry basement having extensive training and experience in the industry. He brings a focused, intelligent approach to each job with which he is involved and is a true professional. After thorough training, Jeff began with the company as an Installation Technician and was quickly promoted to Serviceman, then System Design Specialist. He has excellent troubleshooting abilities and has consulted with hundreds of homeowners, designing effective solutions for every one of them. Jeff has been thoroughly trained and has earned the highly esteemed title "CERTIFIED Waterproofing Professional" through the Basement Systems International Waterproofing Contractor Network. He is a trusted and valued member of the Quality 1st Basement Systems team and upholds the standards of the company. and support through the international company. Jeff enjoys meeting with homeowners and helping them solve their basement/ crawlspace water problems, enabling them to get more out of their homes. He spends his free time cooking new recipes, traveling, fishing and watching all sports. I have had a leaky basement for many years and my son told me to call Quality 1st Basement Systems. My salesman was very professional! The installation team was prompt, polite, and also very efficient. Customer service representative was very efficient and crew was very prompt and polite. The office staff was courteous and helpful and my salesman really knew his stuff. He was well presented. The clean up was impressive! Very good workers and the cleanup was impressive. We are very satisfied with the job done by Quality 1st Basement Systems. The salesman and presentation were very helpful and exact to locate problems and how to solve them. The installation team was professional, clean, and finished the job on time. We have gotten quotes from other companies, but we selected Quality 1st because of the company booklet and portfolio, and they answered our questions thoroughly. 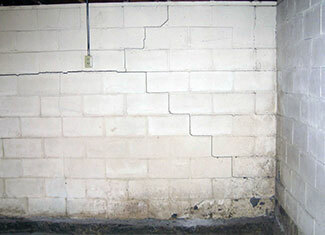 BrightWall basement wall panels will keep this Staten Island garage waterproof and mold-free. BrightWall directs water seepage to a sump pump and keeps the space dry. CleanSpace vapor barrier will keep moisture from coming into this Staten Island, NY basement. It will stay nice and dry. A homeowner living in Staten Island had noticed that water was seeping out of the walls of their basement. This would cause an unsightly stain on the homeowner's walls in their finished basement. 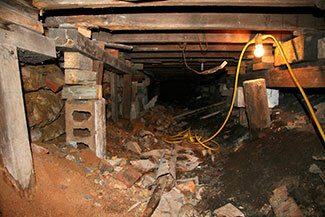 Luckily, the homeowner contacted Quality 1st Basements. System Design Specialist, Jeff Nero, gave an estimate of the homeowner's basement a SuperSump and Waterguard to help remove the water in the homeowner's basement. Project Manager, Juan Garcia, and his crew installed the Waterguard and SuperSump and now water never seeps out of the homeowner's wall. Quality 1st Basement Systems installed EverLast Basement Wall Panels in this Brooklyn, NY Basement. The EverLast Wall Panels have built in insulation and are mold and moisture resistant. This is a great product to finish your basement with and the only system with a warranty against water damage. The Q1 crew also installed new windows to prevent water leakage and cold drafts from coming through. A homeowner living in Brooklyn had noticed that one section of the home seems like it dipping a little due to their crawlspace. Looking for a solution to their problem. the homeowner contacted Quality 1st Basements. Systems Design Specialist, Jeff Nero, examined the homeowner's crawlspace and recommended SmartJack to support the sagging crawlsopace. Projrct Manager, Juan Garcia, and his crew installed SmartJack helping to stabilize the crawlspace. Now the homeowner's house and crawlspace were evened out. To keep this Brooklyn, NY basement dry, Quality 1st Basement Systems installed a TripleSafe sump pump. The owners of this Flushing, Queens home complained that their crawl space was sold cold that it felt like a window was wide open. The cold air was floating into the rest of the home making it uncomfortable and difficult to heat. Quality 1st Basement Systems installed SilverGlo crawl space insulation and CleanSpace crawl space encapsulation system to seal off this crawl space. The homeowners are very happy with their crawl space repair and are nice and cozy all winter! Homeowner in Rosedale, NY contacted Quality 1st Basement Systems when they noticed their foundation started to settle creating their floors to become uneven. System Design Specialist, Jeff Nero, noticed a few cracks and sagging beams inside the crawl space and so he recommended SmartJacks. SmarkJacks restores the sagging beam to its original position while stabilizing it to prevent future damage to the structure. These SmartJacks provided the homeowner with superior foundation support, making the structure of the foundation safe again. This New York homeowner was looking for wall options to make one room in his basement more presentable. Quality 1st Basement Systems installed the BrighWall Paneling System. BrightWall panels are plastic panels that are 100% waterproof and washable. They are clean and bright making your walls look nice and neat. The IceGuard will prevent water from freezing in the sump pump discharge line. This Glen Oaks, Queens basement will be safe in winter! This basement had bowing walls with horizontal and vertical cracks which the NY homeowner knew were signs of foundation problems. They contacted Quality 1st Basement Systems to meet with a specialist who could provide a permanent solution. System Design Specialist, Jeff Nero, recommended Carbon Armor Wall Reinforcing System to stabilize the basement walls. The larger strips are fiber reinforced polymers that are ten times stronger then steel and will slowly pull the wall back to its original position. Carbon Armor is a quick installation with no impact on future basement finishing making it a great solution for this unfinished basement. Homeowner contacted Quality 1st Basement Systems about crawl space insulation. The floors on the first level of their home were cold do to the cold draft coming from the crawl space underneath. System Design Specialist, Jeff Nero could see similar temperature from the outside and inside the crawl space. Project Manager, Juan Garcia and his crew installed TerraBlock insulation and SilverGlo to the walls and floors. SilverGlo is a heat barrier which allows the warm air to stay inside and seal off the cold draft from coming in. The homeowner was surprised to feel a big difference in the temperature of the floors within just a few days of the insulation and encapsulation of the crawl space. Say No to Cold, Uncomfortable Basements! Sagging Basement Floors & How to Repair the Problem!